Anyone else seeing an influx of blog headlines that go “Updated: [Thing That We Just Wrote About] Is A Hoax”? While Internet hoaxes have been around since the Soviet Union wanted to join Usenet in 1984 (remember LonelyGirl15? ), we’ve had quite a few doozies this week, from the woman who got a tattoo of 152 of her Facebook friends on her arm, to the eHarmony user tearing up over her love of cats, to the kidnapped lesbian Syrian blogger turning out to be a not kidnapped married guy in Scotland. Heh. People have always been gullible, and gullible people having access to methods of dissemination like Facebook and Twitter only turns their folly up to eleven. But aren’t we as reporters paid to be filters of news, in essence paid to know better? Then why the rampant media coverage of every single one of these hoaxes? The only answer I can come up with is that the demands of churnalism (or the recently dubbed “hamsterization” of journalism) and the quest for advertising traffic are only increasing for bloggers as more and more readers spend more and more time and money online. This begs the question: How many of us uncritically posting on incredulous rumors and unverified viral stories are cynically calculating how even more traffic will inevitably come from our correction posts (“Update: This Was A Hoax, Again”)? Perhaps the more innocent among us are fooled by the fact that the Internet has also increased the amount of ridiculous but true news. Media frenzies like #Weinergate and Sarah Palin’s description of Paul Revere’s ride remind us that there is plenty of bona fide news that people wish was fake, making the tech media landscape pretty much a crapshoot for bloggers focused on speed. Even we covered that Facebook Friends tattoo story as if it were serious news. And how I wished that that story were real, letting me transform it into some bloated pseudo-intellectual weekend think piece about the ephemerality of online friendships and the quest for permanence in a digital age. Instead you guys get this. It was only after I discovered that the susyj87 YouTube user account only had uploaded one video prior to “My Social Tattoo” and any kind of identifying details about the poster were nowhere to be found did I drop it as a viable source for reblogging, moving on (quickly as always) to the next source of news. But man, like everybody else, I wanted to believe that some idiot got this breathtakingly dumb tattoo. I mean it could happen, right? In 2011 a retweet can function as the online equivalent of gawking at a car crash, even when the story seems too good (or more likely, bad) to be true. 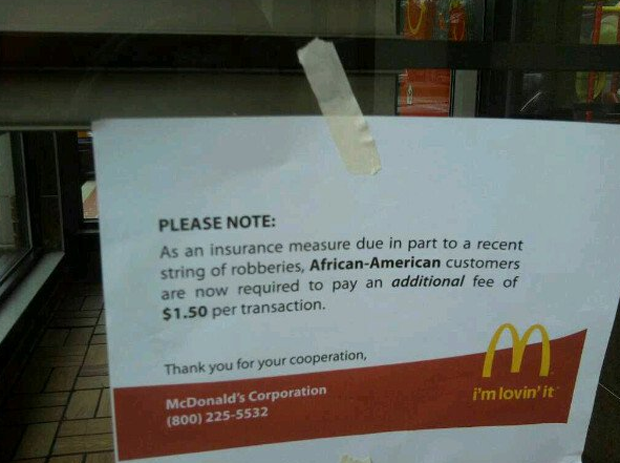 Perhaps this is why the hashtag #SeriouslyMcDonalds was a trending topic this morning, after a sign mandating African American McDonald’s patrons pay a $1.50 surcharge went viral. Even McDonald’s Twitter account quickly declared this a “hoax”, but the #SeriouslyMcDonalds hashtag continues to appear in around 20 tweets a second. Perhaps the most interesting hoax story to come out of an slow summer week otherwise filled with Apple news, was the tale of a David Voelkert, who was arrested after his ex-wife lured him into revealing his plans to murder her, by posing as a teen admirer on Facebook. While the initial wave of stories were along the lines of “Man Arrested After Wife’s Facebook Teen Ruse SHOCKER ,” the updates to the story provided a very interested interesting twist, as it turns out that Voelkert suspected that his wife was behind the fake profile and went to a notary in order to prove himself innocent before sending the otherwise incriminating messages. Voelkert did what we bloggers should be doing more of, taking what happens online with a grain of salt. Granted, he probably had way more time.